After this year’s CinemaCon and NAB came to a close, and as everyone returned to address the mountains of email and work that piled up in their “normal” work lives, a handful of CJ editors, contributors and industry professionals that had attended began an email discussing their own thoughts about the shows. By the end of the week we realized this impromptu virtual conversation may be interesting to others in the market and thus, sought there permission of participants to post it here on Celluloid Junkie. J. Sperling Reich: I know we each have our areas of focus while at a show like CinemaCon and NAB. I, for instance, attend the studio presentations to know what titles will be hitting theatres over the next ten months, whereas I realize not everybody who attends the show does that. Even so, what were your takeaways from this year’s conventions. CJ Flynn: My three takeaways from this year’s CinemaCon/SMPTE/NAB fortnight was Barco’s apparent runaway commoditization of the laser driven projector, the vibe that Event Cinema finally has eroded the barriers that have kept it at bay and finally, that subtle things can trump exquisite nuance. By that I mean, for example, the SMPTE HDR demos will be remembered for the odd circumstance that that ceiling lights – there to subtly wash the walk paths in the dark – were tied together with the adjoining theaters so that they couldn’t be turned off. They didn’t blind you, but you knew they were always in your peripheral field there and they were always there disrupting the contrast. Just like during the next day’s panel, when questions were asked to better define HDR and the moderator always twisted them to what turned into a Dolby commercial instead of saying the obvious – “We don’t know whether 6000:1 (Barco) or 8000:1 (Sony) or 1,000,000:1 (Dolby) meets the requirements, except we know that we can’t get around the seeming constants of glaring disruptions of exit lights or odd port windows or clever floor washes”. J. Sperling Reich: So that’s a perfect example of what I was referring to. I know you CJ spent a lot of time looking at the technology being presented at this year’s shows. Patrick I know you on the other hand, like me spent a lot of time during CinemaCon in the Coliseum watching the studios sales pitches. What did you think? Patrick von Sychowski: It was interesting to hear every celebrity go up on stage and say that there is nothing like the big screen experience, “in YOUR theatres.” None of them mentioned the Screening Room, but it was the elephant in the conference room for the whole show. So a proposed technology for the home – which at the moment does not have the FULL support of ANY studio or exhibitor (AMC apparenty has a LOI, but that’s all) – sucked the oxygen out of pretty much all other technical discussions. Does it mean that we have reached a technical plateau in cinema and that higher dynamic range et al is not as exciting as the promise of yet another home platform, this one contingent on collapsing the day-and-date window? My personal wish is that there had been more time devoted to discussing big data, audience analytics and insights. This too me is the true next frontier of Digital Cinema 2.0 – the Cloud. But further to your point about the house lights, CJ, I wish that someone had stood up and said, “The cinema is the best possible movie experience, but don’t neglect to clean your toilets. Or replace your dim projector bulbs. Or shield the screen from the EXIT and house lights”. The existing digital cinema installations could be made so much better in most cinemas if only cinema owners exhibited it to its best potential. We don’t actually need HDR to have a better cinema experience if exhibitors did the best with what is already there. The best thing about a Dolby Cinema, is that they have taken care to optimise everything, not just the dynamic range, but the seating, the ambient light, the sound in the auditorium it’s in. J. Sperling Reich: It’s kind of like the difference between going to someone’s home and they have a great stereo system and they haven’t calibrated the speakers or audio levels in the slightest. You look at all the expensive equipment and think, “Boy that music could really sound better, if they just tweaked the treble a bit”. James Gardiner: I must admit, after reading all this and looking at it from a pragmatic point of view – I get the feeling the studios are looking into the fact that with HDR consumer electronics displays looking so good, and a large portion of the population not able to get to the cinema, etc. They may be playing with the idea that bypassing cinema in some regions with day and date release on these new technologies may be worthwhile. The emissive displays just look sooooo good, even compared to Dolby Cinema. The 108nit peek luminance looks great and is as good as I have ever seen cinema but…. Yes, the lack of leadership on HDR for cinema is getting extreme. I get the feeling they wanted to ignore it and just stagger forward. But I don’t feel they can in this environment. J. Sperling Reich: I don’t know if I agree whether the studios are in such as release to completely collapse the theatrical release window. It earns nearly $40 billion in revenue per year, not all of which would be made up by releasing films directly into the home. CJ Flynn: I suppose it is partly a presumption that there is a ‘they’ out there and that they really have time to explore and develop options, when it is probable that they are just reacting to options as they cross into potential viability. There are so many companies which are really just small, overwhelmed business units fighting for some share of the corporate pie to simultaneously develop something good/better/great and also react to their competitors as they throw products over the convention or business model transom. But I marveled at how J.J. Abrams stood up in front of all those exhibitors and kept talking about investigating new technology and being willing to accept change…in his full Showman of the Year glory (…and I say that with the deepest respect for his many talents) walking as close to the line and almost crossing it by saying that we have to keep looking at new things and advancing and…just when I think that he is going to use the words “Screen Room”, he wraps everyone in the room into a giant moment with the words…you have the full quote, don’t you Patrick? J. Sperling Reich: I think J.J. Abrams may have been the only member of the industry to talk at all positively about Screening Room at CinemaCon this year, at least publicly. Everyone else seemed to speak out against the whole idea in one form or another. Many exhibitors seemed to be down on 3D too, and yet the companies in the space seem to be continuing to innovate, or at least try to, from what I can see. Barco went to a great deal of trouble to get some incredibly beautiful ARRI demo material for their Flagship 6P system, and looking in the center from my middle position you got great views of the forest greens and deep contrast, but a third of the picture to the left and a third to the right were darker green and had less contrast because of the vignetting of the high gain silver screen. This is the same for Christie and for any 6P system – are we being fooled by these 60,000 lumens numbers? Are they really not grand enough to light up these palaces without a high gain screen? What I really don’t get is that if the AMC chain isn’t going to show 3D in the Dolby Cinema rooms, why not have a clean low gain matte screen. The same goes for the two 6P rooms at LA Live; give my eyes a white screen. Don’t get me wrong, I’m a DolbyVision and Atmos and Barco fanboy, but we’re supposed to be serving the art and slaves to the standards. I can possibly be convinced that for 3D there is a reason for being underpowered and use 10-bit color, but why is a 2D image allowed to be so destroyed? I don’t mean to be picking on Barco or Dolby, or Harkness or RealD, or any of the others since this is the way of the world, except in France. It’s just that the new DCI pronouncements are a Recommended Practice, and go a giant step toward guidance, but there is a logical step missing. James Gardiner: I agree, you would expect the use of these 6P laser projectors would mean they could move away from high gain screens and the problems that they bring. Maybe it is a misunderstanding and the “not thinking” with installers going with what they typically need for such large screens. I have seen amazing pictures with laser, but then again they have been in model installations that didn’t represent the real world. Pragmatically CJ, I understand you have all these issues in terms of what is being done with silver screens and how it falls outside of what is SMPTE spec in many situations. But a picture on screen and lack of care to these standards are not unexpected due to the limitations of 3D. I’m far more in favour in moving away from silver 3D in general, apart from what is possible with colour differential or what people like to call Dolby 3D. J. Sperling Reich: I didn’t get a chance to go this year, but did any of you get a chance to see the Barco Escape demo? Mark Waldman: Just as with 3D, the Escape format can truly be amazing, if content is created by the right director that knows how to use this new tool. I assume that many people will expect that action movies would work best on this format, but I believe that alternative content can also work, especially after seeing previews of a Lady Gaga and Tony Bennett concert in the main square in Brussels. 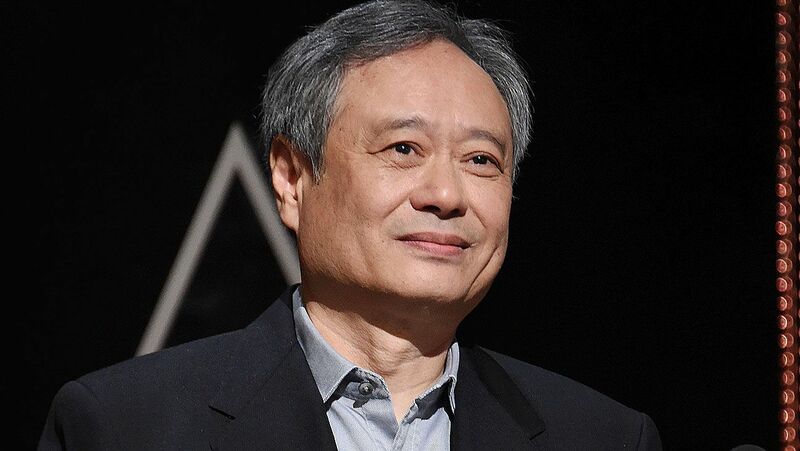 J. Sperling Reich: Well given the overall direction this conversation has headed, I’m going to assume you were all, unlike myself, at the high frame rate, high dynamic range demo Ang Lee gave at NAB. I think it was 4K, 3D at 120 frames per second and caused quite a stir. Now I wish I had been there to witness it because I don’t know if it is even possible to project the demo again. At least not in the near future. No cinema is capable of playing the content that way. CJ Flynn: Ang Lee was funny. He broke the 4th wall by telling us that often he’ll just go silent to let others presume he is stoically thinking so that they’ll figure out a solution to some problem or take on more than they’ve offered in the case of a manufacturer who has to commit to some back-breaking need. I don’t know if it is true what he said, that they want to take on the back breaking work and wouldn’t do it if they didn’t want to. It reminds me of the trope about James Cameron, who supposedly said that he didn’t do his job as a director if he didn’t put at least one post house out of business during the making of a movie. Having been a manufacturer in that position, it is a trap to have such an honor. It is great when you pull off the impossible, but letting go of employees…not so much. 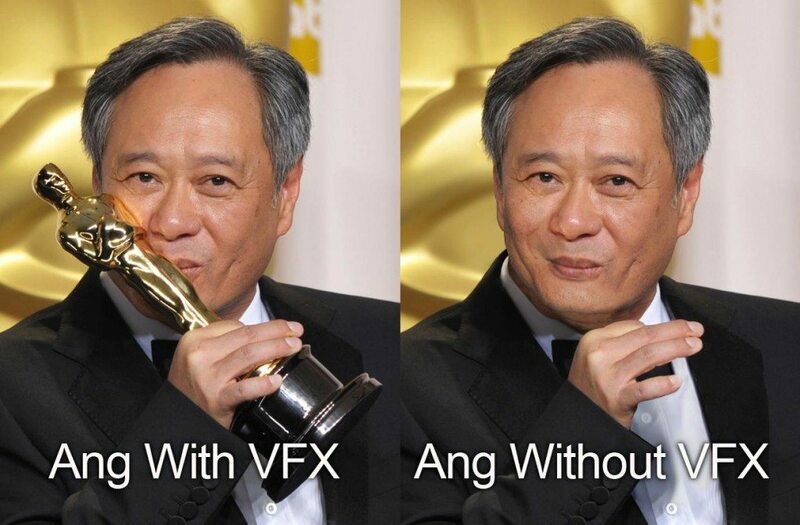 Patrick von Sychowski: Let’s not forget that VFX artists were furious with Ang Lee for forgetting to thank them in his “Life of Pi” Best Director acceptance speech – prompting one to post a picture of Ang Lee with his Oscar Photoshopped out [see below]. Not long after the VFX house that worked on “Life of Pi”, Rhythm & Hues, did go out of business, so Ang Lee is obviously a visionary and busness match for Cameron! But looking at the quality of what we saw in the “Billy Lynn…” demo, there was no question that what we saw was the birth of something new and wondrous. I call it end-to-end reality on the big screen. I’m not saying that Ang Lee will get it 100% right, because who managed to get sound or colour completely right on the first film it was used? But he has opened a new chapter. What impressed me equally was the humility with which he approached this new cinematic language. Trumbull’s “UFOtog” impressed, but it takes a visionary artist like Ang Lee to find a compelling story to tell with it. And you’re correct Sperling, the only shame is that there are right now zero cinemas in the world that can display the film the way we saw it. How many more will there be by the time the film premieres? James Gardiner: My biggest take away from the Ang Lee demo is that Ang is a far better showman than all that have preceded him in terms of turning up the technology and image quality. Ang is right – we are fighting a perception of what people are comfortable with, and when it is simply an image on the screen with little emotional impact, the critique is always negative. All they see is “difference” and not better. Change is BAD in general when no perceived benefit is seen. Ang was clever enough and talented enough to make the demo not only about the better technology but about how to use the better technology as a tool in the creation of the art form used. The real test would have been to see it again in the 2K 3D 60 frames per second that most DCI projectors are possibly capable of and see if it had the same impact. That would be very telling in terms of what is creating the buzz. The super high quality itself, or the combination of the two; art form used correctly with new, cutting edge technology. Mark Waldman: When the clip of “Billy Lynn” appeared on the screen, all I could say was “WOW!”. It really is amazing but just like 3D and Barco Escape, I agree with what everyone has said – the right director will be needed in order to properly exploit this format. J. Sperling Reich: Well since we seem to be sticking with technology, rather than talking about which of the trailers for upcoming films we liked, one thing I noticed at CinemaCon this year was a new wave of software for theatre owners. It’s as if the industry got the technical aspects of digital cinema down and now they are going to see how technology can improve their marketing and operations. CJ Flynn: I must admit to being baffled by all the nuance in the software available for the exhibitor between booking all the way through to the TMS. There must have been 20 companies at CinemaCon showing their wares. I’m going to have to build a matrix and a system flowchart and a few Venn diagrams to get it all straight. I’m also glad someone had a presentation concerning the hard of hearing and visually impaired, you know deaf and blind community problems. The solutions available are a few years old now and need a revisit to see if they meet the task. I saw the Sennheiser system in their booth and would like to see how customers meet the challenge of mounting the iPhone solution it uses. Somehow Sennheiser seems to think they don’t need to answer that question, just leave it up to the user. How will seat neighbors deal with the extra light in the room? The Dolby/Doremi and USL systems try to inhibit light pollution but I still receive stories of how the necks on the drink-cup holders they use eventually get weak. And that’s are lady a marginal solution given that the user has to focus on the screen, then focus on the words then focus on the screen and keep flipping back and forth. Note to self: check out a cinema with the Sony glasses and see if they are still as cool as they seemed when they were released. It was interesting to hear that Hawaii has mandated several open caption viewings for all movies. Patrick, does Celluloid Junkie have budget to send me to Hawaii to see how that is going? Patrick von Sychowski: I’m assuming you’d want to fly rather than row to Hawaii? But seriously, it is encouraging that individual states and cinema chains are taking a lead on the issues of access. Too often we forget the technical advances that digital cinema enables for most viewers are incremental quality improvements, so to certain groups of people, they make all the difference between ever being able to enjoy a film in the cinema or being disenfranchised from it. But there is definitely unfinished work to be done here in Digital Cinema 1.0 before we jump to 2.0 HDR, 120 fps and so on. With populations in developing economies aging rapidly (heck, even in China this will soon be an issue), maybe the greatest technological advance will be the ability to bump up subtitles to 1.5x their normal size. I’m not saying we don’t need further advances in many areas of cinema, but let’s not leave important tasks half-finished in the technologies that have just come on line. J. Sperling Reich: So like large type books for senior citizens, you’re suggesting large type subtitles. Actually, though I said this to be funny originally, it might make sense. 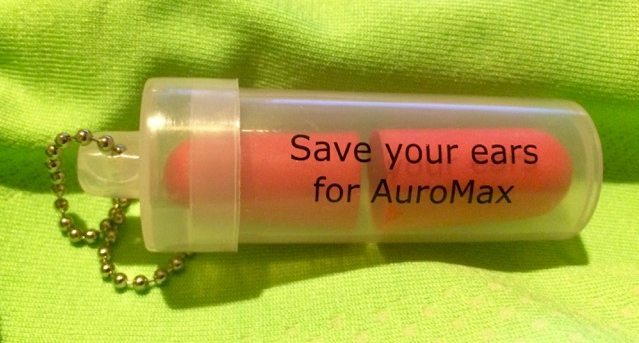 CJ Flynn: Before we completely wrap up our thinking on this year’s CinemaCon, I don’t want to forget to nominate the AuroMax earplugs as the Swag of the Show, just for its cleverness. It also puts forth more proof that this is the era of subtleness, the time after the heavy lifting. AuroMax is the concept of an object oriented Auro system, which was presented several years ago as a coming tool at the SMPTE/NAB Future of Cinema Weekend. Then, 18 months ago, Barco got the assets of Iosonno to incorporate into what they are now calling AuroMax. They are “showing” this technology but saying it is not available until the standards are set at SMPTE later this year. Come to think of it, the second generation of digital cinema technology is taking a lot longer than the originators anticipated. RealD, for instance, presented the well worked out technologies of their new screen technologies in SMPTE papers in 2012, and released the embossed versions a couple years later, which is what MiT and Harkness have available. But the new technology that they showed at CinemaCon this year took until now to productize. Laser technology is similar, taking nearly a decade before finally blossoming this year … and even that is only from Barco. They’ve finally got what they call the Flagship in dozens of facilities and are finally able to give a price for retrofitting. Mark Waldman: Well if we’re wrapping up I want to go back to one of your initial points CJ. You said that event cinema, or alternative content may finally be finding some success. I think that the experience of watching theatre, opera, ballet and concerts in the cinema, is really special because they are directed just like a movie. You can really see the details in the scenery, the costumes, primary as well as secondary actors. Because of this, I actually think that it is a better experience to watch alternative content in the cinema than in the actual theater, excluding the fact that venue for a live performance is usually quite beautiful and historic. Unfortunately, and here’s where we may have differing opinions, many cinema goers just don’t know that this programming is available in the cinemas. And many cinemas don’t seem to understand how to market alternative content properly to reach a new type of audience for the “cinema”. Patrick von Sychowski: Hey, how come I didn’t get an AuroMax earplugs?! Forget the Screening Room and 120fps – swag is what these trade shows are ultimately about, aren’t they?